Demonstrations continue in Khartoum as protesters gathered for a second day outside President Omar al-Bashir's residence and army headquarters. Saturday's turnout attracted the largest number of protesters since demonstrators started calling for the president to step down three months ago. Police fired teargas at protesters on Sunday as people rallied outside the army headquarters, calling for the military to back them to force Bashir to resign, according to French newswire AFP. Many remained. “Sudan is rising, the military is rising,” protesters reportedly chanted outside. Bashir's residence is in the same complex as the defense ministry. Reports indicate people spent the night outside so they could begin protesting again in the morning. Meanwhile, Sudan's ministry of water and power said there was a total power outage across the country. The ministry did not say why this had happened, but said in a statement that engineers and technicians were trying to fix it. The first day of protests outside the ministry, 6 April, was chosen because it was the date of the 1985 uprising against president Jaafar Nimeiri. 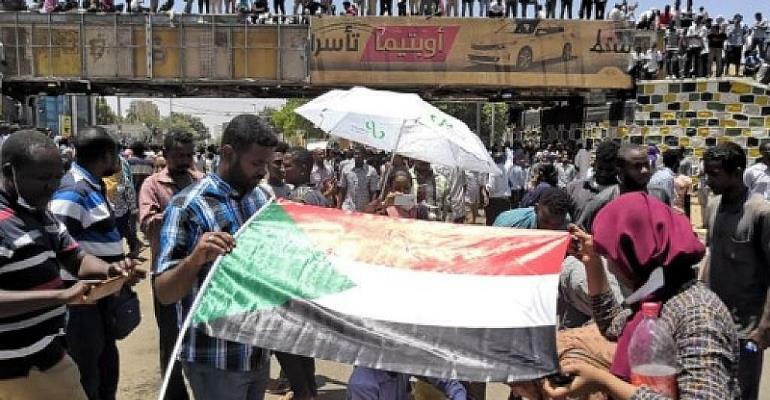 "We call on our people from areas near Khartoum to join those who are at the army headquarters," rally organisers Sudanese Professionals Association said in a statement on Sunday. The army has not been a part of the crackdown on protesters since the beginning. Witnesses reportedly said that thousands of protesters met up in the Burri neighborhood of Khartoum on Sunday, which has been the scene of a number of protests. They blocked several main roads in the area with rocks. One of the people killed on Saturday in Omdurman was a laboratory doctor. Doctors have been key in the protests. Officials say 32 people have died since the protests started three months ago, but the numbers have not been updated. Human Rights Watch says the death toll is at 51 people.